In obedience to Jesus’ request after his resurrection, the apostles remained in Jerusalem to await the gift and promise of the Father; the Baptism of The Holy Spirit (Acts 1:4-5). The Holy Spirit would then empower them to be witnesses for Jesus (Acts 1:8). Together with Mary, the mother of Jesus, they prayerfully awaited this gift (Acts 1:14). When the day of Pentecost came, a violent wind filled the house where they were sitting, tongues of fire came to rest on each of them and they were all filled with The Holy Spirit and began to speak in other tongues as The Spirit enabled them (Acts 2:2-4). For the first few centuries of the Church’s history, these gifts (or “charisms”) of The Spirit were very common in the lives of believers. They are listed by St. Paul in 1 Cor. 12:1-11: wisdom, the word of knowledge, the gift of healing, miraculous powers, prophecy, the ability to discern different spirits and the mysterious gift of tongues and its interpretation. These gifts are the manifestation of The Holy Spirit and are given by God for the common good, as he determines: they are not “earned” or “merited”. As the church became more institutionalized, the gifts of The Spirit became less common and were seen only in the lives of the great “Saints”. Some, such as St. Augustine of Hippo (354-430 AD) initially thought that they were meant only for the early Church, to “kick-start” her, so to speak. However, he later withdrew this opinion in his Retractions, when he himself witnessed the gifts in abundance in his own Diocese. Later one sees the gifts in evidence in the lives of St. Francis of Assisi (1182-1226), St. Dominic (1170-1221), St. Catherine of Siena (1330-1380), St. Teresa of Avila (1515-1582), St. John Bosco (1815 1888), The Cure of Ars (St. John Vianney, 1786-1859) and many others down the centuries. The Cure of Ars is known to have had the gift of tongues. Between 1895 and 1903, Sister (now Blessed) Elena Guerra, foundress of the Oblate Sisters of The Holy Spirit in Italy, wrote 12 confidential letters to Pope Leo XIII, asking that he foster devotion in the church to The Holy Spirit. As a result, the Pope published his encyclical on The Holy Spirit Divinum Illud Munus in 1897. He also sent a private letter to all bishops, prescribing that the Novena for Pentecost be prayed at the dawn of the new 20th century. On the night of December 31, 1900, a group of Methodists, led by Agnes Osman and Rev. Charles Parham of Topeka, Kansas, experienced an unexpected outpouring of The Holy Spirit after studying the Acts of the Apostles. The request of Pope Leo XXIII had received only a half-hearted response from the Catholic bishops, so God turned to his “little ones”, “the anawim”. Thus, the modern-day Pentecostal movement began among Protestants. The call of Pope Leo XIII was picked up by Saint Pope John XXIII in April 1959 on beatifying Sister Elena Guerra. When convoking the Second Vatican Ecumenical Council later that year Pope John prayed specifically for “The Divine Spirit to renew his wonders in our time, as by a ‘New Pentecost’”. The Council, in essence, was to lay the foundation for this New Pentecost by providing “new wineskins” for the Church (see Mt 9:16-17). In February, 1967, during a Duquesne University student retreat at The Ark and the Dove Retreat House outside of Pittsburgh, PA, one of the students, Patti Gallagher-Mansfield felt drawn to pray before the Blessed Sacrament in the chapel. She, and a number of other students who had joined her were later found prostrate before the Tabernacle. There, before Jesus’ Eucharistic presence, the Catholic Charismatic Renewal was born. They had all been overwhelmed by the majesty, power and presence of God. The movement spread rapidly throughout the United States and the world. 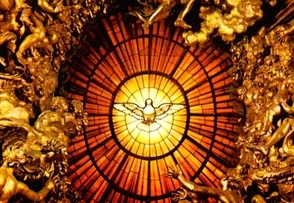 It is estimated that today in excess of 75 million Catholics worldwide have had contact with this renewal and have experienced their own personal Pentecost. Pope Paul VI: During the holy year of 1975, before ten thousand participants of the international Charismatic Conference assembled in St. Peter’s Basilica, Rome, Pope Paul VI described this spiritual renewal as a “chance”, or “opportunity” for the Church and the world.